This is a no brainer of course. Every auto shop needs a lift. But what kind? 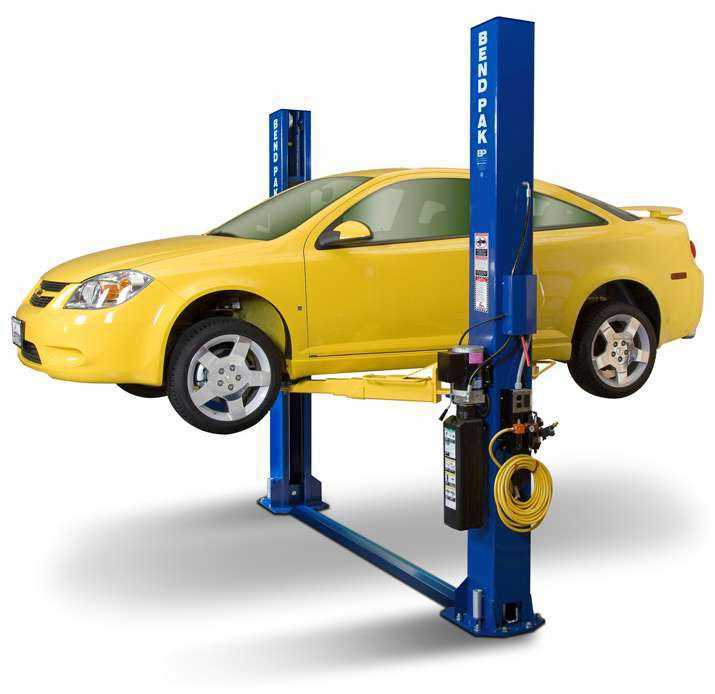 Should you get a two post lift, a four post lift, or some other kind of automotive hoist? There are many factors that should influence your decision. Each type of lift has it’s benefits and shortcomings. No one type of lift is perfect for every application. Of course, if your budget allows for it, you get get several different lifts to allow you to meet any application. 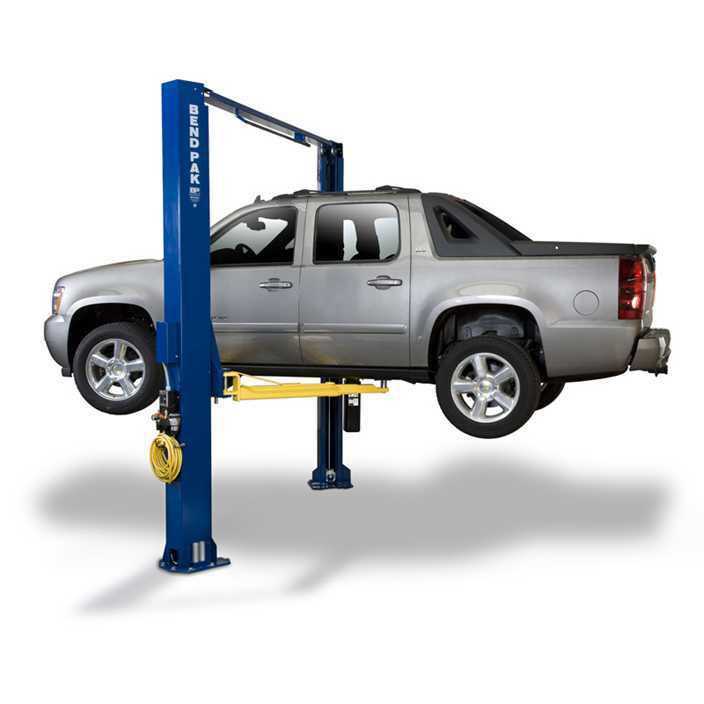 A Two post Lift will give you the greatest ability to access the vehicle for servicing. They give you a full rise lift and allow you to get at every inch of the underside of the vehicle, along with the wheels as well. But sometimes, you may prefer the stability and speed of a four post lift. You can just drive on and off quickly, for oil changes, plus you have more stability when performing major jobs like removing a transmission. And with rolling jacks, you’ll be able to access the wheels for tire rotations as well. Then there are a variety of other types of lifts for specialty applications. Will you be performing alignments? 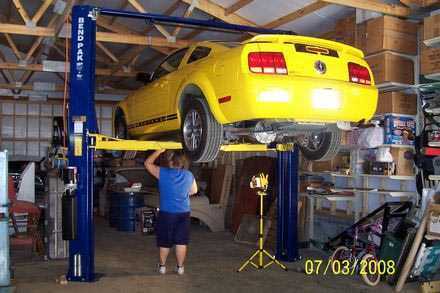 There are four post alignment lifts and scissor alignment rack. Maybe you’ll have a lube shop with a pit and you’ll need a pit lift. 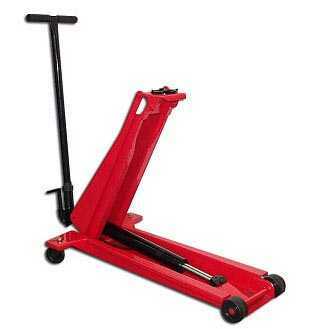 For brake shops or tire shops, you may want to get a low rise pad lift that allows you to remove wheels quickly. If you are a larger garage with multiple bays, you may have the luxury of obtaining several types of lifts to meet every application. Just make sure you purchase a reliable lift from a major brand name manufacturer. There are many inferior quality auto lifts on the market today and we’ve heard many stories from our customers about the bad experiences they’ve had when they tried to cut corners and purchase one of those “bargain” no name lifts out there. The quest to find an alternative AC refrigerant for automotive Air conditioning systems is growing legs as GM is the latest auto manufacturer to announce that it will be using a new refrigerant, HF-1234yf, in many of their main auto models. The move is going to happen in 2013, as numerous models will make the shift, including mainstays such as Cadillac, Chevy and Buick cars. The new refrigerant is HF-1234yf, and has been created by Honeywell. Manufacturers are searching for a more environmentally friendly alternative to R134A, which has been in use for nearly two decades. This new refrigerant is 97% better for the environment. It is proven to have lower lifetime GHG emissions than HFC-134a or CO2. It also requires only minor modifications to current vehicle AC systems, compared to some other new refrigerants, which require a higher pressurized system. Before R134A, R-12 was the refrigerant of choice for decades. The new refrigerant breaks down much quicker than R134A, which means less ozone depleting properties. Auto manufacturers are scrambling to come up with viable alternative to meet new, and increasingly strict EPA (Environmental Protection Agency) regulations on greenhouse gas production. The EPA just recently approved the use of this new refrigerant in February 2011. So the next time your car is up on the Garage Lift at the local auto shop, you may be a candidate for this new product. 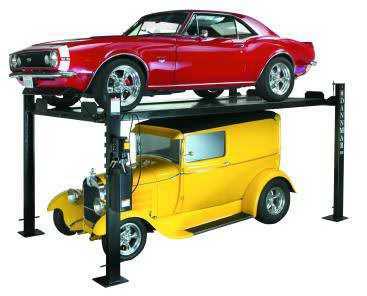 Auto shop owners and individuals who own an Automotive Lift should inspect their lifts on a regular basis. There are monthly maintenance checks as well as daily safety checks you should inspect for each day. Most reputable car lift manufacturers include an owner’s manual which should outline a recommended checklist of routine inspection points. The Automotive Lift Institute (ALI) also issues literature with every ALI Certified lift which advises proper safety procedures, inspection and maintenance for all the various types of lifts. Cracking of the concrete floor around the base of the columns. Look for mounting anchors pulling up at the base of the columns. Look for wear at any part of the lift, paying particular attention the moving parts, (ie: cables, pulleys etc..). Ensure that all locks and safeties are functioning properly. Confirm that arms, runways, posts are not sagging or deformed in any way. Inspect hydraulic cylinders for any leaking hydraulic oil. Make sure all electronic components are functioning as necessary. Listen for any tell-tall noises that might indicate the potential for trouble. Watch for stuttering, or uneven lifting. Watch for signs of wear near moving components, such as metal shavings or dust. If any of these concerns are present, contact a qualified professional to inspect your lift further. You might be tempted to troubleshoot and diagnose the problem yourself, but take our advise and seek a professional technician who knows what he’s doing. Safety is too important. The Automotive Lift Institute (ALI) has warned that they have received specific reports that certain lift manufacturers are making false claims that their lifts are ALI Certified. Reports have surfaced in several areas, including England as well as the USA of lift distributors making these misleading claims. ALI has a special page on their web site dedicated to pointing out these offenders and shining the light of truth on the situation. They point out numerous circumstances of manufacturers and distributors from across the globe of similar circumstances under the heading – “Buyer Beware”. It is vitally important that all instances of fraudulent Certification claims be vetted out and shown to the buying public. If allowed to go unchallenged, false certification claims would lead to consumers purchasing potentially inferior lifts, all the while assuming that their lift meets all the various safety and quality standards that ALI is so well known for. If a distributor tells you their Car Lift is indeed ALI Certified, but you’re not certain, you can confirm it by going to the ALI web site. They have a section there that lists every manufacturer and every single model lift that is ALI Certified. Don’t get taken by an unscrupulous salesman. Verify what they are telling you is true. It’s unfortunate that consumers still cannot trust everything a company tells them these days. Great timing right now if you’re on the market for a quality bench top Battery Charger. It’s their model 520A-PE bench top charger. It’s one of our most popular models, and for good reason. It’s got all the features you would want in a professional Battery Charger. It’s got a fast 10 amp charging rate, as well as a low 2 amp rate for trickle charging. It’s got easy to read color coded gauges with an analog meter. It has reverse hook up safety, and best of all, it’s fully automatic, so it will turn on and off as needed. Go ahead – leave it hooked up indefinitely. Just like they say – set it, and forget it. Don’t worry about overcharging your batteries. It’s got a durable impact resistant plastic case, 6 foot cables and sure grip clamps so you can grab onto those smaller side terminals that are so difficult to keep your clips on. Plus it has a convenient handle for carrying it. It is an affordable unit that is a great value for smart shoppers. Plus, don’t forget, it’s made by the best name in the battery charger industry – Schumacher Electric. They’ve been manufacturing some of the finest products for decades. Our normal price for this model is $63 with free shipping. For a limited time, we are offering them at $15 off our regular price. Your cost is $48 with free shipping. Now that’s a bargain in anybody’s book! You are currently browsing the Car Lift Blog blog archives for March, 2011.